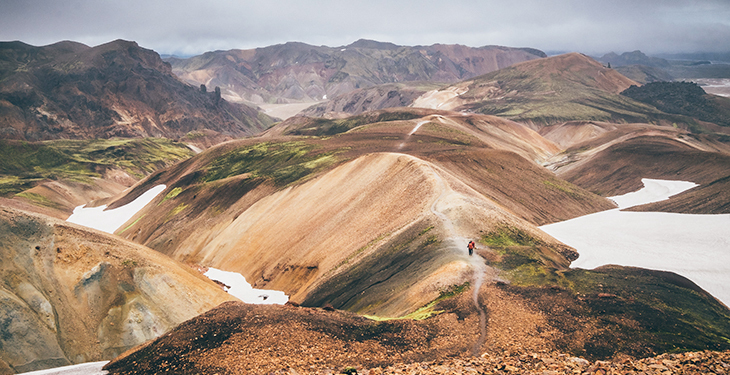 Trek or mountain bike through the Icelandic highlands on the Laugavegur Trail. On foot or by bike, this tour lets you take in the majestic wilderness of Iceland at your own pace. 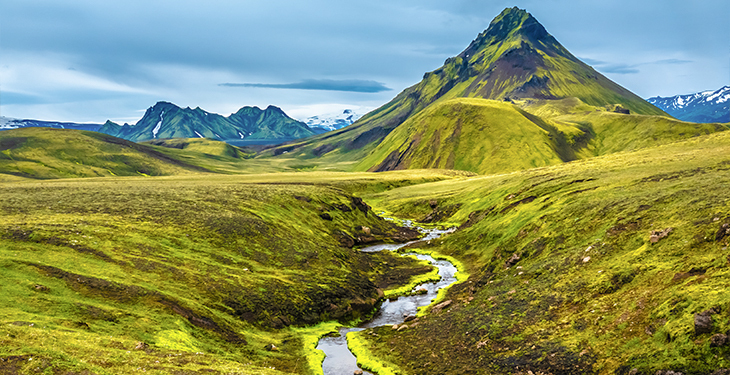 This adventure takes you to Iceland's renowned Laugavegur Trail and Thorsmork, where you can hike or mountain bike through the pristine, awe-inspiring scenery of the Icelandic highlands. This tour is fully supported with an experienced guide and cleverly designed by KB Tambo Adventures to give you maximum freedom to explore. Start your trip in the capital city of Reykjavik, where you'll meet on the morning of Day 1 before heading out for the trails around Hveragerdi for your first hike or ride. On Days 2 and 3 you'll follow the Laugavegur Trail through some of Iceland's most unique scenery, including barren volcanic landscapes, glacial valleys, mossy hillsides, hot springs and still mountain lakes. Each day you'll have a choice of routes to best suit your mood and abilities. At night, you'll stay at local campsites in your own private tent, with meals prepared by your guide and special care taken to ensure you have dry clothing for the next day's adventure. On Day 4 you'll travel overland from Emstur on the Laugavegur Trek to the Thorsmork region. Located in a forested valley, this lush, green paradise hosts a myriad of hiking and mountain bike trails, which you'll spend the next two days exploring. Day 6 takes you on an amazing trail to the waterfall at Skogafoss before returning to Reykjavik for a celebratory dinner. After one last night in Reykjavik, it's time to return home, perhaps stopping for a visit at the iconic Blue Lagoon (additional cost) before your driver takes you back to the airport. Today is designed to accommodate both those who got in a day or two earlier, as well as those with less vacation time or a tighter budget and arrive early this morning but still want a full day of activity. There will be a complimentary airport shuttle available for your arrival. You’ll meet in the late morning at the group hotel and then head out to Hveragerdi, which has some great hiking and biking trails. Hveragerdi has some of Iceland’s most active and interesting mud pots and geothermal activity, including the first of several natural hot springs you'll see on the tour! Afterwards, you'll return to Reykjavik for dinner and an early night to bed. Depart early at 7:00 am, and drive to Landmannalaugar for the start of the famous Laugavegur Trek. This area serves as the base camp of many expeditions and has an exciting feel. 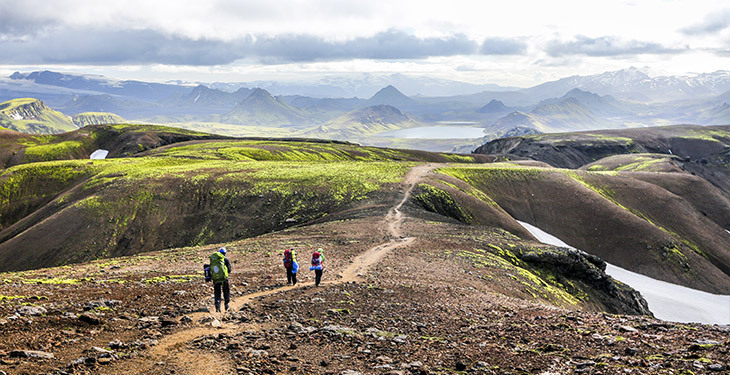 Ambitious and fit trekkers can set out for the full 15-mile hike to Lake Alftavatn. You also have the option of two shorter hikes: from here up into the rainbow, pastel-colored mountains and back down, and then drive to tonight's lake camp destination or a stunning hike on the same trail the others are arriving on. If you wish to bike, you'll take a fun, side trail up a mountain, before riding the epic trail down to the lake. Have dinner and camp at one of the most beautiful, lakeside camping spots in Iceland. Enjoy a more relaxed morning and a big hearty, cooked breakfast before starting the scenic moonscape journey to Emstur. Today those who are mountain biking will get out ahead of the group, arriving first to camp tonight, where there is then the option of a really cool ride for the second half of the day after lunch. The trekkers will cover the 10 miles at their own pace, and then, as always, everyone will regroup for dinner in the evening. The magical kingdom of Thorsmork is your destination today, and it's soon to be one of your favorite places in Iceland. There are several different routes you can take to get there, and your guide will help you choose one that best fits how you’re feeling after a couple of hard days of trekking or biking. 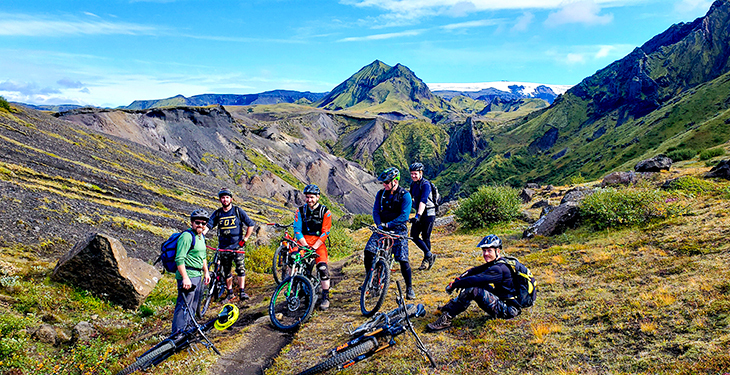 The hiking distance is approximately 10 miles from Emstrur to Thorsmork, and the bikers will have more choices of fresh trails to and around Thorsmork. Today you'll have a well-earned rest day, with the entire day to explore Thorsmork without having to move camp. There are more trails in the area than anyone could cover in a week, so you'll have many different options and today the group can split up a bit if desired, based on ability and energy levels. This is a lush, forested area of Iceland and a reputed hideaway for the many elves that live here. There is an amazing trail that connects Thorsmork with the famous waterfall of Skogafoss on the southern coast. From camp, its a 14-mile steep uphill climb, thus its not suitable for everyone. But, with creative logistics no one has to miss out. Those choosing to opt out (and by now most will be a bit tuckered out from 4 straight days of trekking or mountain biking), will go instead by van to the end of the trail at Skogar, where you'll still climb up to the iconic Skogafoss waterfall, and then have the option to climb up above it as far as you want. There are many other waterfalls that cascade down the beautiful volcanic mountain of Eyjafjallajokull (the same one that erupted in 2010) on a very nice trail. Late in the evening the group will return to Reykjavik for a celebratory dinner and optional Friday night out on the town. Enjoy an included breakfast at the apartment, after which most folks will need to head to the airport, with an optional visit to the Blue Lagoon (which due to its immense popularity must be reserved ahead of time). Your driver and van will be available the entire day today to take you to the Keflavik airport at no extra cost. This amazing trip puts many of the highlights of an Iceland adventure into a thrilling but affordable one week trip. It allows people to either trek or mountain bike so they can travel with a partner if they wish or make new friends with like-minded travelers. Iceland is flat-out stunning, and no place I have traveled features so many different and dramatic scenery landscapes. It is a magical place that is sure to grow more popular over time, so we hope you join us soon! 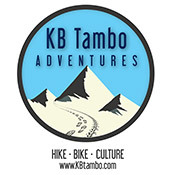 KB Tambo is a small adventure company, specializing in trips for people who don’t normally hire guides. They focus on just a few amazing international destinations, where high transport costs, mountain safety and complicated logistics make traveling in a small group the best choice. They believe in international adventure travel with all their hearts, and think it is one of the very best parts of living life. It’s all they do, and all they've ever done. In business for over 20 years, KB Tambo has been featured or recommended by National Geographic, CNN, New York Times, Red Bull, GoPro, ESPN, Bike Magazine, and many more. The owner, KB, is still involved in daily operations as well as guiding, and is always available to answer questions personally. Known for treating clients like friends rather than tourists, their passion is your fun and safety, while creating trips that are budget-friendly. KB has been my ‘fixer’ on several international adventures - he knows what he’s doing. I had a great time on my Iceland trip, not only riding but just hanging out with the other clients was fun also. Iceland is amazing and beautiful but I got to get down and dirty on a real adventure! Come prepared, leave fulfilled. I did this trip – the trekking version – in September 2018 and although I had heard a lot about Iceland I was not prepared for how beautiful and unique it is. We had mixed weather, and in hindsight it would have been worth paying extra to get the huts, as it rained really hard the first day. But I survived! I had such a fun trip in Iceland and KB Tambo obviously knows what they are doing. The logistics were smooth, and the guides were low-key and gave me my space. But, make no mistake it is not a trek to be undertaken lightly and safety is definitely a factor. We would travel with KB Tambo again. I just got back from my mountain bike Iceland trip with KB Tambo, and wanted to drop a note to KB and the gang to say thanks so much for this experience. KB had to answer a lot of questions from me before the trip, but once I was there I felt prepared for everything. The biking in Iceland was AWESOME. So much fun, so beautiful, and so peaceful. I really enjoyed the Icelandic culture and the riding was sick, lots of variety and not super extreme terrain though plenty fast. I seriously want to go back next year and do the North trip. There is a minimum of 2 people required per departure date. Please wait to make travel arrangements until you receive confirmation from KB Tambo Adventures. Nothing outside of extreme weather or unforeseen events will cancel the departure. Nearly all international flights arrive at Keflavik International Airport (KEF) which is 45 minutes from your apartment in downtown Reykjavik. You should aim to arrive at KEF no later than 8:00 am on Day 1 if possible, otherwise plan to arrive the day before. Please note there is also an airport closer to Reykjavik but you likely will not fly through there. KB Tambo Adventures will have a shuttle at the KEF airport on Day 1, leaving at 9:30 am. Or, if you arrive earlier or later there is an easy and reliable bus service, Flybus, between KEF airport and downtown Reykjavik for around $32. If you elect to arrive early before Day 1, you should stay in or around downtown. The tour uses different lodging each trip based on trip size and date and upon booking you'll be sent a Welcome Packet which will include the exact name and address of where you'll be staying. This is helpful in the event you want to book near the trip accommodations, or even the same place. In town you'll be staying in apartment / home-style lodging with no more than 2 people per room; there are not separate bathrooms inside the bedrooms but there will never be more than 2 bedrooms sharing a modern bathroom with hot water, shower, etc. The trip price is based on double occupancy in each bedroom. The campsites and huts along the route are rugged and very basic. KB Tambo pays for the daily shower and toilet fee required of all campers and for those using the huts. The huts are warm but can be noisy, with dorm-style sleeping arrangements in a common room. There are no single supplements or private rooms available in the mountain huts. In the event you are a solo traveler you'll be paired up with another traveler of the same gender. If you wish to have your own room, a single supplement fee of $300 per person will apply for a private bedroom for the two nights in the hotel. No private rooms are available in the huts. All campers will receive their own tent (no sharing with anyone). The max group size is 10, and the average group size is 7. No meals are included on day one. Breakfast, lunch, and dinner are included on Days 2, 3, 4 and 5. Breakfast and lunch are provided on Day 6, and only breakfast is included on Day 7. While on the trail (Days 2 through 6), breakfasts are typically fresh local bread, butter/jam, cereal, eggs, granola, oatmeal, and famous Icelandic Skyr yogurt. Dinners are heavy on carbs and lots of fresh vegetables including salad with every dinner. Fish and lamb are the most popular meats in Iceland, but every lunch and dinner will have a vegetarian option. Lunches are usually box lunches on the trail including a sandwich, fruit, vegetables, etc. The drinking water in Iceland is of outstanding quality and is in many cases fine right from the tap; the tour includes unlimited filtered drinking water. The trip is designed so that those on a budget can bring as little extra money as possible. Virtually everything is included, such as airport service door to door and meals (except for Day 1 in Reykjavik and dinner on Day 6). The only other thing you would need money for is souvenirs, miscellaneous items, and alcohol consumption, which always adds up quickly in any country. In general, beer and wine are expensive in Iceland ($10 a beer or glass average) and along the trails in the huts, even more so. Plan on $5 for a coke and up to $15 a beer in the huts. Someone on a tight budget who doesn’t drink alcohol could bring only $200 for the entire trip while others could bring up to $500 or $600 for a more reasonable estimate. While it can be warm and sunny for a surprising amount of your trip, Iceland can also be a fierce weather destination, and requires a complete and specialized packing list. You'll be provided a detailed list in your Welcome Packet upon booking. Will I be comfortable camping? How good are the tents? Can I go inside the hut if it is raining? KB Tambo wants to be very upfront that camping is not a luxurious option and the base price of this trip includes tent accommodations to keep the price lower. Staying in a hut costs over $100 per night, and for a couple or two friends, its the equivalent of a $200 per night hotel room. If the weather becomes rainy, camping is doable but not the most comfortable. One advantage you'll have is the use of custom dryers which can be used so you always have clean, fresh dry gear. Tents are expedition quality, with high-end air mattresses. It's not quite ‘glamping’ but your guides have invested a lot into ensuring a dry and warm sleeping experience and it works very well. The huts are all reserved for paying guests only, and campers do not have the option of going inside the huts, even if it is raining. You can upgrade to staying in huts all 4 nights for a total of $350 per person. Please note that this option is generally not available once you arrive - the huts all sell out months in advance. Occasionally one will open up due to a cancellation, but in general they must be reserved by January or February in order to get one for that year. If you're interested in this option, KB Tambo will do their best to arrange a hut for the additional fee but it is not guaranteed. Will rain affect my trip? The two downsides to travel in Iceland are the high costs and rough weather. The reason people push through those, is because it’s worth it! Iceland is one of the most amazing places you'll ever visit, even if it does rain a lot. With proper rain gear, the weather is manageable. KB Tambo has an awesome system for always having dry gear, which is the key to an enjoyable trip. With their support, you don't have to let rain stop you from having fun. They also put a lot of energy into weather logistics, meaning the guide will adjust the itinerary schedule when appropriate in order to maximize the fun and maintain comfort. What support is provided during the trek or bike ride? The whole Icelandic tour concept is based on helping you have the most fun and most comfortable adventure possible. After a dozen times experiencing the trails, your guides have learned what is most needed, helpful, and difficult to do on one’s own. Guides will support you during your hike or bike ride with extra dry gear and van drivers can drive you during specific days of the tour when you’re not up to it or modify the plan a bit to match the weather. There are even special, custom made dryers to dry out your stuff at night, if necessary. Proper support is incredibly helpful for an adventure through the Icelandic highlands, this is not a Ring Road tour! How do I know I will be able to hike at my own pace? KB Tambo is dedicated to allowing clients the same experience they could have on their own, only better. That means, among other things, that they know how to let fast hikers and bikers do their own thing and go fast, while those that want to go at a slower pace don’t have to feel one bit rushed. The details will vary depending on location and circumstances, but everyone will be able to go at whatever pace they wish, and not have to worry about affecting the plan at all. Will there be showers and toilets? While in Reykjavik (in apartment/hotel) and on the road (gas stations/restaurants), everything is just like it is back home. While on the trail, or at the huts of Alftavatn, Emstrur, and Thorsmork, the facilities all have toilets and hot showers available for an extra charge, but KB Tambo pays both those fees, for everyone, every day. The toilets are remote outdoor facilities and usually clean but not luxurious. What is the biking like? Will I be able to get in enough riding? The mountain biking is outstanding and ridiculously fun! It is not especially technical, though a full suspension bike is recommended, say with 150mm travel being ideal. There are climbs but not very long or steep, while the descents are long, fast and rolling. The volcanic sand is a fast surface, as are the singletracks. You'll be able to ride as fast and as far as you would like each day, your guides will make sure of it - guaranteed. If possible, yes. It is always better to bring your own bike on a trip like this since you'll be on it a lot and will want to maximize your enjoyment. Rental gear of any kind is never as familiar as what you are used to back home. It does usually cost extra to bring a bike, and each airline is different, however some allow 2 checked bags with an international ticket purchase and even allow a bike to be one of those bags. For those who don’t have or don’t want to bring a bike, yes there are a limited amount of rental bikes available, but at $75 per day it is actually cheaper to bring your own bike. Contact KB Tambo Adventures with any questions, they are experienced with transporting bikes on airplanes, and will help you from beginning to end whether you choose to bring one, or rent one. Will I have to carry my things while trekking or biking? No! Just a small daypack with your camera, snacks, and extra clothes. One of the biggest benefits of this trip is being able to travel lightly through very remote and rugged terrain without trying to carry all your gear on your back. In good weather, going light makes the trip way more enjoyable. In bad weather, support becomes critical. When you finish each day, your tent or hut will be waiting for you, as will a quality hot meal cooked to your individual preference. Why is the trip so expensive? First, due to its remote location as an island in the North Atlantic Ocean, nearly everything in Iceland has to be imported from Europe. This increases the price of vehicles (especially!) but also gasoline, food, lodging - basically everything. And, as a country with a very small population (there are significantly more travelers and tourists than there are people to work) wages are very high. The extremity of the terrain and climate means everything from the gear to the vehicles has to be specialized and high quality. KB Tambo has worked as hard as possible to make the cost as low as possible. This trip is definitely on the lower end in terms of cost, and if one accurately and completely runs the numbers, they will find it is often less than you could do it for on your own. Lastly, when traveling on your own, just one or two common mistakes can set a whole trip back in time or money. And there really is no way to bike or trek through this rugged terrain except by carrying everything on your back, or using support. Are there opportunities to explore on my own? For the most part, yes. Your guides know people value their freedom and independence, which is one reason so many are reluctant to take a “group” tour. In the afternoons especially, there may be time to explore after you arrive at the camps, though safety (cliffs, boiling mud pots, glacier crevasses, etc) is a legitimate issue so please be sure to discuss with your guide first. What about internet / cell phone access? Iceland has excellent cell phone service in most places and the Thorsmork huts you'll stay at for two nights have wi-fi so you can catch up on work and family. Most travelers find that by checking with their regular cell carrier before coming over, they can activate their phone for their trip to Iceland without having to replace the SIM card, etc. Rates vary, check with your carrier. Book confidently with Free Cancellations within 72 hours of booking. After 72 hours, cancellation fees will apply. Cancellations are subject to the full discretion of KB Tambo Adventures. For more information on our Travel Cancellation Policy please Click Here.